Students will be able to mix primary colors to create secondary colors. Gather your students where they can see the book. Show students the cover of Mouse Paint. Invite your students to predict what the book may be about. 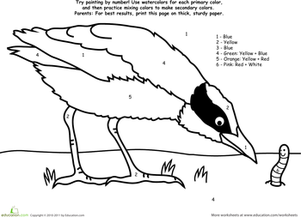 Tell your students that they will be using some ideas from the book to create colors. Read the story while paying particular attention to the colour mixing. After reading the book, tell the students that they will go back to the book to make some notes. Go back through the book and list the colors the mice made on a piece of chart paper. Use colour markers as you chart the colour combinations. Hang the colour chart where every student can see it. Point to the primary colors and explain that these colors are called Primary colorsBecause they are used to make other colors. Point to the secondary colors and explain that these colors are called Secondary colorsBecause they are made from mixing the primary colors. Give every student an orange, green, and purple crayon. Tell your students that you will hold up two primary colors. Ask students to respond by holding up their secondary colour crayon that represents that colour that those two primary colors make. Proceed by holding up the following combinations using crayons or cards: blue and red, red and yellow, and yellow and blue. Continue in this way until your students are holding up the correct secondary colors without hesitation. Now give every student the primary colors and reverse the activity. 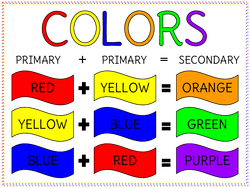 Tell your students to hold up the two primary colors needed to create the secondary colour that you show. Proceed by holding up orange, green, and purple colors until your students are responding confidently. Collect the crayons and have your students remain in the circle. Hand out the colour Wheel worksheet. 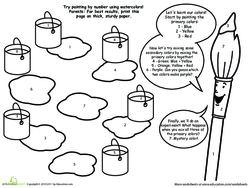 Tell your students that they will be using tempera colors with cotton swabs to complete this activity. Model how to use the primary colors to create secondary colors. Model how to put the correct colors on the right numbers in the worksheet. Place an example where your students can refer to it. 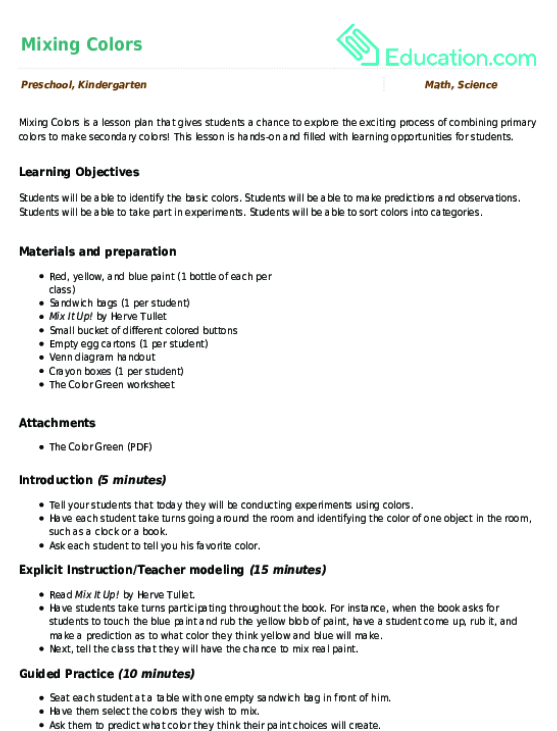 Place the Colors visual guide where students can see it. 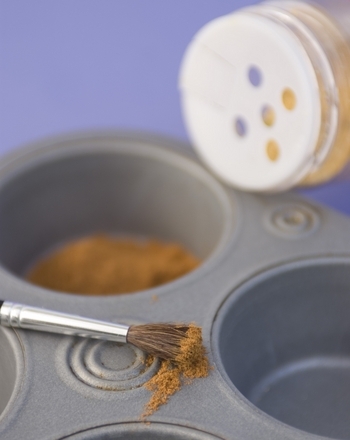 Use small paper plates with a drop of red, blue and yellow paint for each student. Give each student several cotton swabs to mix and paint with. Observe and guide your students as they work. Enrichment:Advanced students may continue mixing paint as they complete the black and white version of the Colors visual guide. Support:Some students may need a visual guide at their table spot. 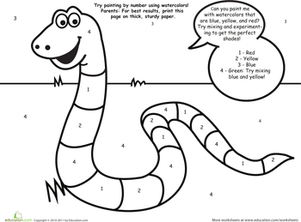 Some students may need help identifying which number should go with what colour on the worksheet. During Guided practise: Your students should be able to hold up the correct colors when responding to your colour prompts. During Independent Working Time: Your students should be able to mix the primary paint colors to create secondary colors. Your students should also follow directions and place the colors in the correct spots. Ask your students to describe primary colors. 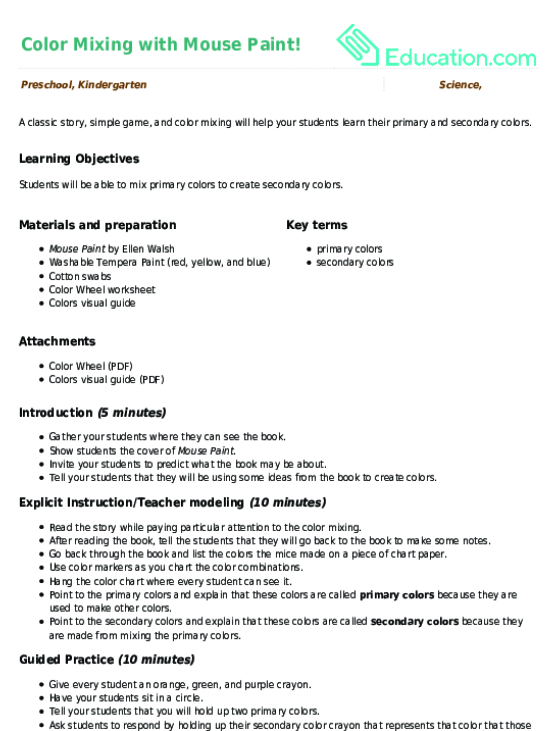 Have your students discuss how secondary colors are different. 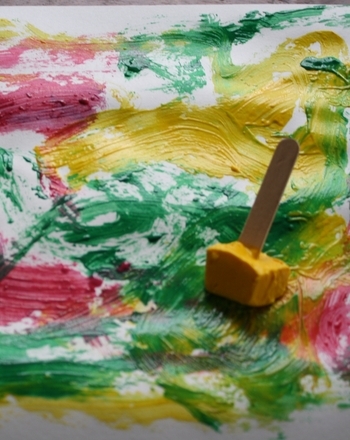 Ask your students to think of other ways they could use colour mixing. Compliment your students on their colorful work! Coloring sheet of The Country Mouse, from Aesop's fable, Country Mouse, City Mouse. 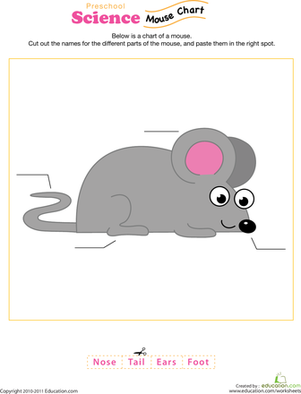 Your preschooler can use her counting skills to help this country mouse through the city to meet up with her friend. This lesson is hands-on and filled with learning opportunities for students. A coloring sheet featuring the City Mouse, the character from the kids' story. Teach him to paint with natural dyes from food! He'll be amazed that food can be made into art, just like in ancient times. 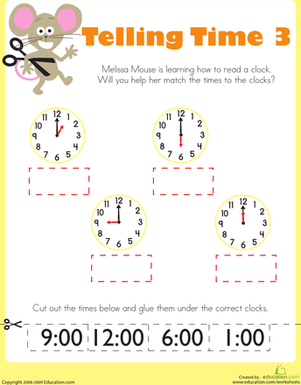 For this year one maths worksheet, kids help Melissa Mouse tell time. They cut out digital times and glue them under analog clocks with matching times.